bk-EBDP Crystals is a chemical research compound that is classified as a stimulant. The IUPAC name for bk-EBDP Crystals is (benzo[d][1,3]dioxo1-5-y1)-2-(ethylamino)pentan-1-one. The chemical formula for this research compound is C14H19NO3 and the molecular mass is 249.310. Since this compound is so new we can use research on its analogue to learn more which is 1,3-Benzodioxolyl-N-ethylpentanamine. 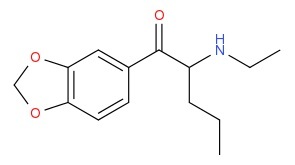 1,3-Benzodioxolyl-N-ethylpentanamine has an IUPAC name of 1-(1,3-Benzodioxol-5-yl)-N-ethylpentan-2-amine with the molecular formula of C14H21N02. The average mass is 235.322 and the monoisotopic mass is 235.157227.
bk-EBDP Crystals is a chemical research compound that is classified as a stimulant. The IUPAC name for bk-EBDP Crystals is (benzo[d][1,3]dioxo1-5-y1)-2-(ethylamino)pentan-1-one. β-Keto-3,4-methylenedioxy-alpha-propyl-N-ethyl-phenethylamine (Ephylone, BK-Ethyl-K, BK-EBDP) is a stimulant compound developed in the 1960s, which has been reported as a novel designer drug, identified in some samples of powders sold as “ETHYL-K”. Research result shows that Ephylone has similar effects as to ethylone. The effects of BK-EBDP can vary from midle euphoria to moderate stimulation. The effect of BK-EBDP depend on the customers need and can be easily regulated from one to another. The tension of sensations depends on the dosage and the method of use of the research chemical. bk-EBDP is a psychoactive drug and member of the phenethylamine chemical class which acts as an entactogen, psychedelic, and stimulant.